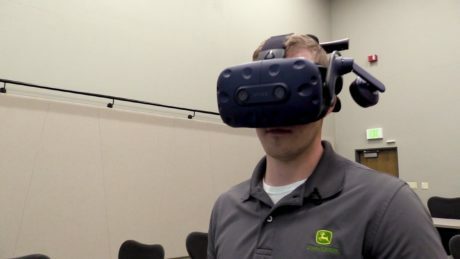 Virtual reality technology allows the John Deere product support team to visualize tractors early in the design process, which in return shortens the time from concept to production. Daniel Sheremeta uses a virtual reality headset to visualize tractor design in real-time. When designing a tractor, it’s difficult to foresee every challenge a customer might experience using the machine. But designing with a simulated 3D model, which John Deere employees can climb on and under, sure makes it easier…not to mention more fun. Daniel Sheremeta, a customer product support representative, is using the technology to, above all, increase distinctive product quality and uptime for customers as he and Deere’s Global Tractor Customer and Product Support team work on Next Generation Tractor designs. Sheremeta works at the Product Engineering Center (PEC) in Waterloo, Iowa, at one of John Deere’s virtual reality (VR) labs. The lab itself is a room big enough to fit a real tractor, which is appropriate given that the virtual version is a full-size replica. The lab’s 30-foot projection screen shows others in the room what the person wearing a VR headset is seeing. To demonstrate how the technology works, Sheremeta puts on a VR headset — which covers his eyes and has adjustable headphones. He grips two controllers that simulate the actions of his hands, allowing him to pick up tools he will use on the tractor. 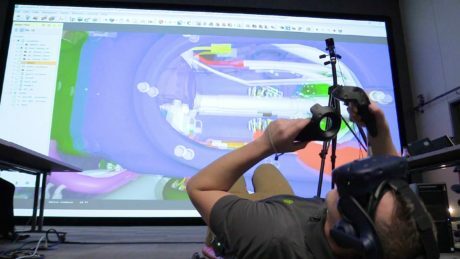 The lab’s VR software creates a real-time simulation that builds in the effects of gravity and parts colliding. The VR software places him inside a 3D environment where he can perform service on a machine that looks incredibly life-like. Using a stepladder, he can climb up to work under the tractor’s hood and he can use a creeper (a wheeled device) to lie on his back and roll around underneath the machine. Lee Birch, Advanced Visualization supervisor, supports employees who use the lab. Using the computer software, he can create a model of a John Deere tractor comprising as many as 20,000 individual parts. 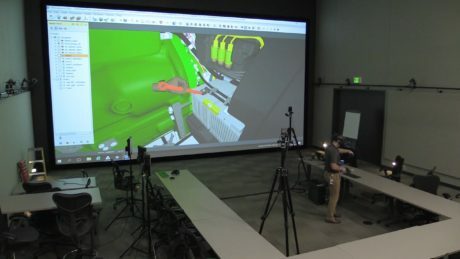 The virtual environment also comes with simulated mannequins, which can be moved around to see how an average-sized operator or service technician would access various parts on the machine. The lab’s biggest advantage is that it saves employees time and expense, as they don’t have to assemble or take apart an actual machine in the “real” world. The parts on a virtual tractor come off quickly with a few quick turns of a simulated wrench. “This technology helps in virtual validation and is comparable to a physical validation,” said Amol Sanap, a team member working in Pune, India. Jason Pedersen, a drivetrain and hydraulics Customer Support engineer, recalled using the lab to see how easy it would be to change a rear brake manifold on one specific tractor design. The team had already used traditional tools, and the results were inconclusive, but in the virtual environment Pedersen confirmed the repair is easy to perform. As lab supervisor, Birch guides a lot of first-time users through their virtual experience. He can see what they’re seeing on the giant screen and walk them through how to move around the tractor, move inside the tractor, pick up tools, and find the way out if they get stuck — yes, users can actually find themselves inside a large tractor part and not know how to get out. 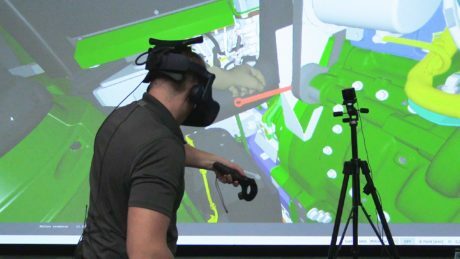 Although the space at Waterloo’s Product Engineering Center has been dedicated to a virtual reality lab for 18 years, the technical capabilities have evolved. Deere has similar virtual reality labs at facilities in Dubuque, Iowa, and Mannheim, Germany. Better yet, Deere’s Customer and Product Support teams are having fun while designing tractors that will make farming easier for future generations.